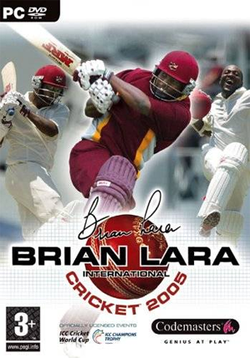 Hello Everyone, I want to share with you an amazing oldie game known as Brian Lara International Cricket 2005 (or Blic05) It contains the 2003 Cricket World Cup in Africa and the 2004 ICC Champions Trophy. These two competitions are licensed by the International Cricket Council (ICC) and contain official player names, faces, kits, badges and sponsors. There are a few types of cricket that can be played in the game. Test match, Test series, One Day match, World Cup, ICC Champion’s Trophy and practice mode. Along with the types of cricket there are several difficulty settings. Slog mode, village, county and test. With each difficulty bowling and batting decreases in ease. The game also offers the player to construct their own team from cricketers already in the game, and to construct their own “Career Players” who gain experience with each match. There is also a “Classic XI” mode, which has famous cricketers of the past such as W.G. Grace, Imran Khan and Jim Laker. There are also a challenge mode in the game, where the player can take on cricketing challenges based on notable cricket matches from the past. The player can either recreate or rewrite history, depending on the team they choose to play as. These include such matches as The birth of The Ashes, the 1933 Bodyline test match, Garfield Sobers’ six sixes, and the 2003 ICC Cricket World Cup final. There are 10 challenges in total. Burn or mount with Daemon tools/UltraISO/MagicISO. Copy the cracked content located in the Crack directory on the Data to your installation directory. mujhy batao brain lara wali gamedownload kaise karon?